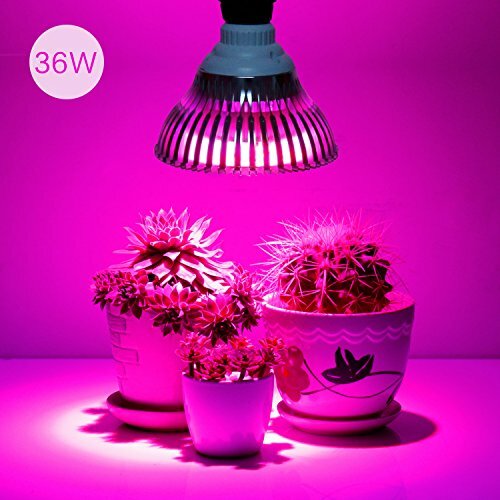 EFFICIENT BRIGHTNESS: 12pcs 3W LEDs, more brightness, better photosynthesis performance. Really help the indoor plant which need lights to promote growth. PERFECT LED RATIO: 3pcs blue LEDs+9pcs red LEDs. Blue light is good for photosynthesis, and help to induce Chlorophyll and Carotenoid. Red light is best for budding, flowering and fruiting. TARGETED SPECTRUM: Blue 400-470nm and red 610-720nm can be almost fully absorbed by the plants photosynthesis. This light provides 660nm red light and 460nm blue light, they are respectively peak of growth spectrum for maximum chlorophyII A and B production. PLANTS LOVE IT : Ribbed design with pure polished aluminum, it helps to cool down the light temperature after long time continuous use. The lifetime is up to 20,000 hours. To protect the grow lamp, we suggest the continuous use time is less 17 hours. No radiation and other side effects, good partner to gardeners. WARRANTY: we promise 12 months free warranty. If anything need help, please feel free to contact us 24/7 customer support. If you have any questions about this product by Levin, contact us by completing and submitting the form below. If you are looking for a specif part number, please include it with your message.